Mazda hinted at a future EV with this rotary range extender-equipped prototype in 2013. Mazda will launch its first EV in 2019, and it’s likely to use a rotary as well. He did say, however, that the car is likely to use a new-generation rotary engine as a range extender, similar in concept to a BMW i3. So the return of the rotary could be two-fold, with the EV alongside the production version of the RX Vision concept unveiled in Tokyo last year. In 2013, Mazda showed off a Mazda2 RE prototype, which used a similar rotary range extender EV system. At Mazda, we are developing an EV system by ourselves. The revelation of the EV production plans came during questions around Mazda’s relationship with Toyota, which has already resulted in a Scion-badged Mazda2 for the US market, as well as a Mazda3 hybrid that uses Toyota Prius mechanicals. Fujiwara-san confirmed that the propulsion system would be made in-house, rather than obtained from someone like Toyota. He wasn’t keen to reveal too much (“It’s still a big secret,” he said), but admitted that a larger car would likely need a new platform, thanks to the potential size of the battery packs that would be needed to power it. It’s more than likely Mazda will debut the EV technology in either a Mazda2 or Mazda3, but a CX-3 could also be a viable recipient of EV tech. Fujiwara-san explained that an EV would help the company’s brand image, but would not become a “core product”. He reminded journos that the total count of EVs on the road is low, and will still be low in four years’ time, and that petrol engines will be around for a while yet. Fujiwara-san said that hybrid technology did not fit in with Mazda’s current range of naturally aspirated SkyActiv engines. Even though the as-yet unnamed EV would be available to all markets – and Australia is Mazda’s biggest market outside Japan – it’s very unlikely that the car will be sold in Australia. 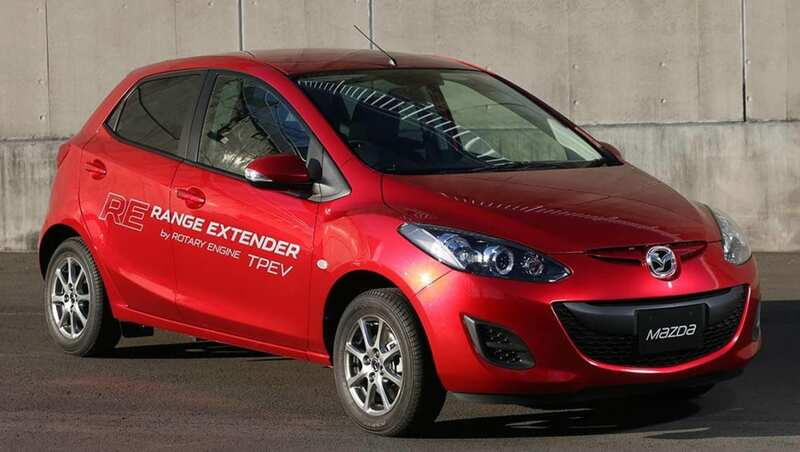 Senior Mazda Australia officials have made it clear previously that only a change in government policy that allowed EV owners to claim concessions or tax breaks would make electric vehicles viable for Australian roads. Will you be lining up for a Mazda EV in 2019? Tell us what you think in the comments below.